What is the purpose of using sulphur dioxide in wine? Justin Knock (JK): Sulphur dioxide (SO2) is used in wine as both a preservative and an antioxidant, and it is a vital ingredient in small quantities to ensure the quality of the wine remains as high as possible by the time a bottle is opened. It has been used by the wine industry for centuries and is what allows fine wines to keep for as long as they do. Why is there a sudden interest in how much SO2 is used in wines? JK: A number of producers and commentators belonging to the natural wine movement are advocating reduced, or zero usage, of SO2, based on the very properties that make it useful, ie. its preservative and anti-microbial properties. They feel SO2 inhibits the expression of natural microflora and other characters in wine. Elsewhere, some consumers are concerned by the mild allergenic properties of SO2 but nevertheless, it is surprising its use has become so topical. SO2 is used in a wide range of food products, including fruit juices and dried fruits, where the levels can be up to three times as high as is allowed in dry table wines. Of course, there are strict regulations about how much can be added, and legislators are increasingly keen on reducing the levels across all food types. With this in mind, it is particularly important that winemakers manage additions at the time of bottling, to ensure that their wines remain consistent and pleasurable to drink. Can you make good wines with less SO2? JK: Of course and, at Encirc, we support moves to reduce SO2 concentrations. With healthy grapes at harvest, good winery hygiene and fastidious attention to detail during wine maturation, the use of SO2 can be reduced right through the production process. We continue to support using small doses at bottling, as it protects wines from the most obvious masking faults, such as oxidation, which can lead to bruised apple aromas, or Brettanomyces spoilage, which give band-aid and farmyard smells. At levels above 40 parts per million (ppm), free SO2 does mask the natural fruit aromas and the varietal character of a wine, so in recent years we have seen growing interest in moving towards lower or zero SO2 wines. However, it is extremely difficult to create consistently high quality wine without using any SO2. How much SO2 should be used in winemaking? SO2 (m) çè HSO3- (aq) çè SO32- (aq). This molecular form provides microbial protection at concentrations of 0.8 ppm. 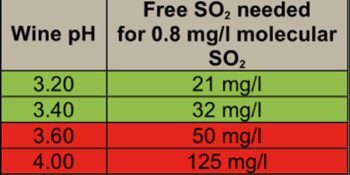 The table below shows how much free SO2 is needed to reach this level of molecular SO2 at different pH levels. Many wineries look to make wines that are at a pH of below 3.6, because above this pH, the amount of free SO2 required to protect the wine starts masking fruit flavours, and can lead to throat and eye irritation, or other allergic responses in sensitive sufferers. In practice, all wines can be made with levels below 40ppm free SO2. However, to be able to achieve much lower levels (below 25-30ppm), wineries need to consider other methods, such as low temperature storage, sterile filtration, in combination with SO2 in order to achieve overall wine stability and protection. In order to minimise the overall SO2 in wine, it should be added in a small number of large quantities rather than many small increments, as this will maximise its effectiveness. How do oxygen levels affect SO2 concentrations? HP: Traditionally, SO2 levels are determined by the general rule of thumb that 1 mg/l of dissolved oxygen (O2) causes a 4mg/l drop in SO2. However, this is a guide only, as oxygen reacts with many components in wine simultaneously, and the consumption of SO2 by oxygen occurs at a very slow rate. The primary antioxidant role of SO2 is against hydrogen peroxide (H2O2). O2 preferentially reacts with phenols (tannins), producing hydrogen peroxide (H2O2), which then reacts with the SO2. If the H2O2 does not react with the SO2, it will act on the alcohol in the wine, forming aldehydes that give bruised apple aromas and flavours. SO2 binds to aldehydes, thereby eliminating the bruised apple and sherry-like aromas, but in this bound form the further effectiveness of SO2 is also reduced. Is oxygen really bad for wine? HP: The inclusion of oxygen in wine is often viewed as a negative, but at the start of the fermentation process, it is essential for fixing colour, ensuring healthy yeast and modifying the tannin profile. It is post-fermentation where oxygen really needs to be monitored and controlled, because the opportunities for it to contribute positively to the wine’s character are greatly reduced, while the risk of negative impacts increase. This can include browning, loss of fruit flavours, and accelerated development of the wine, making it drier, flatter and more mature-looking. The most sensitive point at which oxygen can be picked up at greatest risk to the wine is at the point of bottling. If this is not controlled all the good work to manage oxygen levels up to this point can be undone. At Encirc, our filler double-evacuates the bottles of any air, before charging them with nitrogen prior to filling. This means that the wine is then entering a near 100 per cent nitrogen environment and, as a result, oxygen pickup is minimal. Depending on the initial dissolved oxygen (DO) of the wine, we regularly bottle wine with 0.2ppm of dissolved oxygen, which is global best practice. Most companies would be nearer to 1.00ppm or even higher. How else can you keep oxygen levels down? HP: The gas in the headspace contributes just as much – if not more – to the amount of oxygen loading on the wine. In order to combat this, Encirc has reduced the fill height on its bottles from 55mm to 30mm. This roughly halves the amount of Total Package Oxygen (TPO), which is the combined amount of headspace and dissolved oxygen. In addition, the cap shoot has also been moved, so the cap is placed on the out-feed of the filler. This further reduces the time the wine is exposed to the air, resulting in an even greater reduction of TPO. What levels of TPO should wine contain? HP: Encirc’s average TPO value is 1.2ppm, although this is greatly determined by the initial DO. If a bottling facility has high levels of DO, and doesn’t take into account the headspace of a bottle, the TPO could quickly exceed 5ppm – a level that would require a greater level of free SO2 to protect the wine. Less than 4.0ppm TPO would be considered satisfactory by most bottling companies. What advice do you have for those considering reducing SO2 levels in wine? HP: It is vital to fully understand a bottling plant and the points at which the practices could cause more SO2 to be needed. If these risks can be minimised, the dependence on sulphites can be reduced. Other technologies, such as sterile filtration, or the inclusion of sorbate, velcorin and other microbial inhibitors, can be used in combination with SO2 in order to achieve lower overall SO2 levels. That said, it would be a brave company who did away with SO2 without having another form of microbial control for its wine.